Digital Hand Dynamometer - SAEHAN DHD-1. 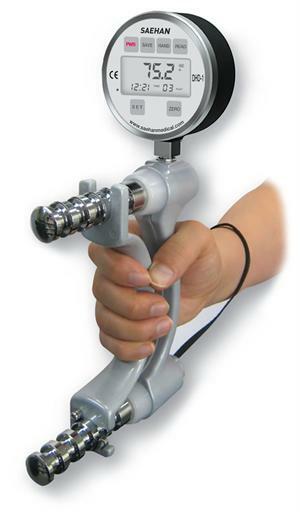 Our most sold Hand Dynamometer 2012. The DHD-1 Digital Hand Dynamometer has three modes of operation: Setting Mode, Testing Mode, and Reading Mode. The buttons perform different functions depending on the current mode of operation. saved in memory with the corresponding test result. Testing Mode is used for testing grip strength and measuring the maximum grip force applied. which indicates the number of test results stored in momory for each hand. Reading Mode is used to display the test results for each Test Number saved in momory.